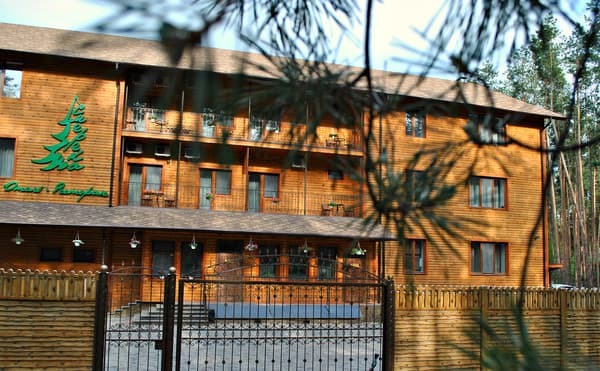 The hotel and restaurant complex Smereka is located in the green area of ​​Svyatogorsk. In a protected and picturesque place, surrounded by a pine forest. In its well-maintained territory there are 6 comfortable two-storey cottages (4 standard and 2 deluxe), a hotel for 20 rooms, a restaurant and a swimming pool. Cottages are equipped for comfortable living at any time of the year. The complete set provides independent heating, system "warm floor", the conditioner and hot water supply. The rooms in the hotel building are equipped with double beds, cable TV, refrigerators and air conditioning. Guests can enjoy breakfast in the restaurant, and cottages can be cooked independently in the equipped kitchen. There is a spacious restaurant hall with a fireplace for up to 120 people and a cozy summer terrace. On the territory of the complex "Smereka" there is a swimming pool open. For the youngest guests in the territory is a children's playground. There is also parking for cars. The complex is located in a picturesque place near the pine forest. Description of the room: Spacious room with a bedroom and a guest area. Extra beds are available for an additional fee. Description of the room: Cozy two-room suite with a double bed. Extra beds are available for an additional fee. 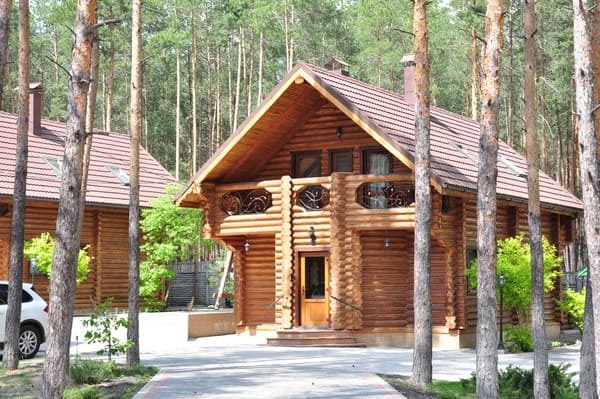 Description of the room: Cozy comfortable room with a view of the forest reserve Svyatogorye. Description of the room: One room in light colors. Equipped with a double bed and a sofa. Description of the room: On the first floor of 2-storey cottages is a living room, kitchen, bathroom and hall, on the second floor there are 3 bedrooms and a bathroom. 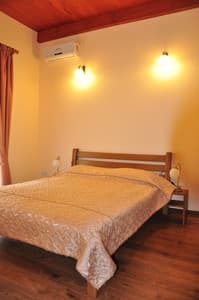 Cottages are equipped with autonomous heating system, air-conditioning system, "warm" floor system and hot water supply for comfortable rest at any time of the year. There is a free parking for 2 cars, a wooden swing, a summer table with benches and braziers, located near the cottage. 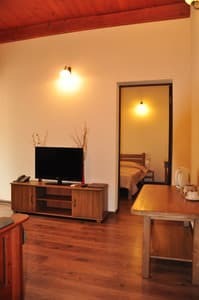 Description of the room: On the first floor of 2-storey cottages is a living room, kitchen, bathroom and hall, on the second floor there are 3 bedrooms and a bathroom. 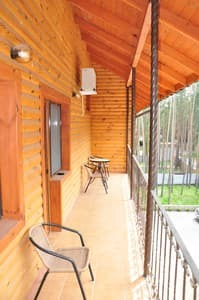 Cottages are equipped with autonomous heating system, air-conditioning system, "warm" floor system and hot water supply for comfortable rest at any time of the year. There is a free parking for 2 cars, a wooden swing, a summer table with benches and braziers, located near the cottage. Up to eight people can be accommodated. Children under 6 years without a separate bed are accommodated free of charge. It is possible to provide extra beds. The service is chargeable, requires prior approval upon booking. 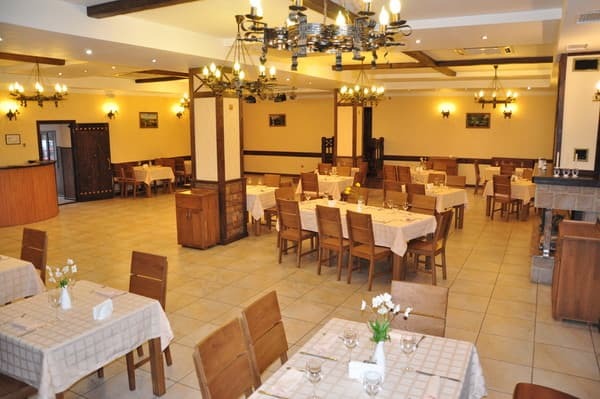 There is a spacious restaurant hall with a fireplace for up to 120 people and a cozy summer terrace. On the summer verandah of the restaurant is a hospier-Spanish unique oven, combining the advantages of a traditional (closed) Russian stove and a barbecue. 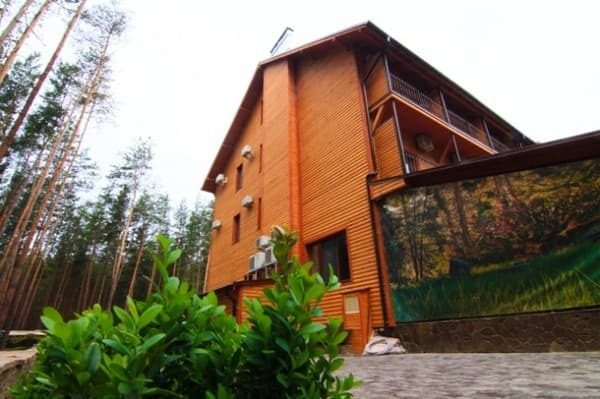 The hotel and restaurant complex Smereka is located in the green area of ​​Svyatogorsk, near the pine forest.